This project was created on 04/29/2015 and last updated 3 months ago. XORYA is extremely low cost game console that consists of just 1 chip (in its base configuration) - DIP28 integrated circuit PIC32MX170F256B (32-bit MIPS core, 256K flash, 64K data memory) and a few capacitors and resistors with total cost below $5. XORYA is connected to NTSC TV through composite video input and it&apos;s running applications created with help of open source game library XORLib ( https://gitlab.com/shaos/xorlib ) specifically developed for this platform. XORYA may produce a number of black and white video modes (with 640x200 maximum resolution) and (potentially) stereo audio with 15734 Hz sample rate (through PWM). Also with external crystal 14.31818 MHz and 2 more capacitors it may produce color NTSC signal similar to "composite" mode CGA with 16 colors (actually 15, because 2 gray colors look the same) and resolution 160x200. To make video memory compatible with CGA I also changed 32-bit DMA-to-SPI to 8-bit (because SPI sends higher bit first and in case of 32-bit it works as big-endian, but it has to be a little one) and surprisingly it did not negatively affect performance (text mode even became 43% faster because now it is not required to mask single byte in the word to write a character). And before adding project here the progress was reported on DangerousPrototypes forum. This version is a little bit faster because it&apos;s running on 60 MHz core frequency instead of 57.27272 MHz as previous one. To build something with XORLib you need MPLAB.X IDE and XC32 compiler (but NOT new one, it has to be v1.34 or older because of plib.h - old versions could be found here ). As you can see it is "Direct-to-TV" kind of gamepad with 2 buttons on the right (green and red) and analog joystick on the left (currently it&apos;s 2-axis joystick from Parallax that costs more than $5). With composite video cable you can see cables for stereo sound (generated by 2 PWM). Later I&apos;ll add 2xAAA case on the back and power switch (it&apos;s not needed yet while I use PICKit3 to play with it). Interesting thing is the fact that PIC32 chip is actually a cartridge with the game ;) In order to simplify process of inserting and removing of such game I put there a ZIF-socket (cost about $10). So the big idea is to present Xorya as an open source indie game platform with dedicated online store that will sell actual physical retro looking games for it (in form of preprogrammed PIC32 chips) both open source and proprietary with prices $5 and up. Hi! I really like your schematic diagrams! How did you generate them? Is this circuit outputting its own schematics on a TV screen? Wow, that would be epic! I&apos;d love to see the badge doing some handheld gaming like this! Is the 10k resistor required if we connect MCLR directly to the PICkit3? Can&apos;t wait to try Mandelbrot. This project is awesome and I want to build mine. Do you know what is the difference between PIC32MX170F256B-50I/SP and PIC32MX170F256B-I/SP? Which one do you use? How are you getting 16 colors from one GPIO? Are you using CTC's to phase split the color burst freq into exact 22.5 degree sectors or perhaps just roughly timing with CTC/INT and relying on the CPU clock to maintain sync to color burst (sub-carrier) freq? then NTSC TV caught different colors from patterns 0010 0011 0111 etc. Ah, so splitting into 90 degree sectors. 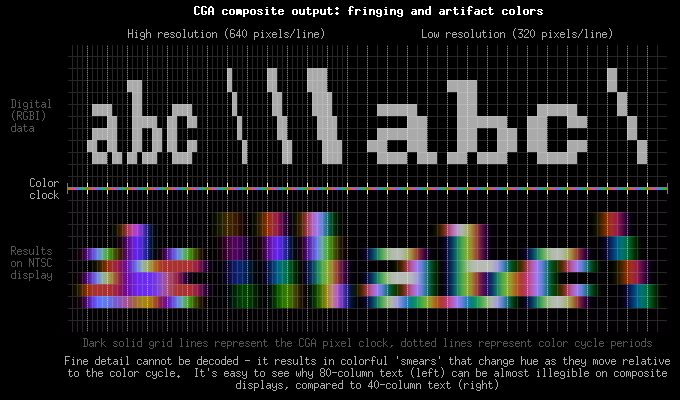 Sending 4 bits per color sub cycle and hence the res of 160px width => (Scanline / color sub) * 4. So chroma is 0 to 4. 0 for black, 4 for white and 1, 2 or 3 for everything else. One (4 bit) cycle per pix and hence the boundary bars between colors. This could work much better at 2 or four times the clock freq and repeating the bit pattern 2 or 4 times but short of PLL it would be hard to generate these frequencies. PS: The color boundary bars are predictable and you could code to prevent them by adding / removing bits that keep the chroma in an even transition rate and at the same time balancing the phase (as best can be done with 4 bits). ie going from color 1000 to color 0001 does not need chroma correction as both are 1 but sending 0100 0010 for adjacent pixels may correct the phase for the boundary bars. There is a limit with composite TV signals because they were bandwidth limited to get many channels over air. Both NTSC and PAL have a sound sub-carrier that is not much higher than the chroma/luma so the input circuitry in the TV has cut-off filtering. The old retro computers squeezed as much as possible out of TV's before abandoning them and going to monitors. The last standard that TV like or compatible was CGA. Compounding these limits, is the fact that you are using a square wave. It is in fact the attenuating effect of the boundaries of the TV's input filtering that are somewhat 'correcting' this generated signal so that the following chroma/luma circuitry can decode it. The base frequency of a square wave is the reciprocal of it's period. A rectangular wave has two base frequencies. One each that are the reciprocal of twice that active '1' period and also the reciprocal of twice the in-active '0' period. By changing the duty cycle so that you have a very low or very high duty cycle you are relying on a much higher frequency component that may well me lost in the TV's input filtering. This is the limit. The advantages of the the circuit here http://www.ze.em-net.ne.jp/~kenken/en/videogame.html are that by having a simple DAC the output is less square like and more sine like. The second advantage is that chroma and luma can be generated separately. Your circuit has no chroma control. The resulting chroma from your circuit is simply the number of '1's in each group of four and that is why you have bands between colours. So 0011 has chroma of 2 and 1100 has chroma of 2 but the four middle bits between the two nibbles (11 11) have the chroma of 4 and hence the bands. At the same time the phase transition is averaged giving a different color. It would very interesting to test this with PLL and CPLD/FPGA but for me I am going with VESA standards for (x)VGA. It will very interesting to see how far you can go with horizontal pixel resolution. PAL ('I' and 'BG') has 625 lines interlaced 2:1 ie 312.5 lines per frame offset by one line so it may give reasonable results. Not all of these are visible. Good luck, I will be watching keenly to see how you go. How about dsPIC? They can be clocked up to 80mhz, have a bunch of DSP accelerated functions already provided by Microchip. Wow, that Mandelbrot Set rendering is amazing. Even more so from a microcontroller. Excellent job. this is really neat and quite impressive. You are about to report the project "XORYA - extremely low cost game console on PIC32", please tell us the reason.